Laughter Matters is a fantastic organization in San Diego bringing laughter to the lives of senior citizens. Marianne leads a class. Laughter yoga has so many amazing physical. mental, and spiritual benefits. I can’t even begin to tell you how awesome it is. You just have to try it for yourself! 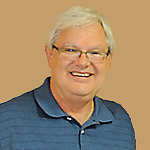 Richard specializes in Laughter Wellness & Laughter Yoga for Seniors. The objective of this study was to compare the effectiveness of Kataria’s Laughter Yoga and group exercise therapy in decreasing depression and increasing life satisfaction in older adult women of a cultural community of Tehran, Iran. Sixty subjects completed the study. The analysis revealed a significant difference in decrease in depression scores of both Laughter Yoga and exercise therapy group in comparison to the control group. The increase in life satisfaction of Laughter Yoga group showed significant difference in comparison with the control group. Laughter Yoga is at least as effective as group exercise program in improvement of depression and life satisfaction of elderly depressed women. © 2010 John Wiley & Sons, Ltd.
Research Study PDF © 2010 John Wiley & Sons, Ltd.
Further studies should be conducted including men and larger populations. Please contact Richard Taylor, Certified Laughter Yoga Leader if you would like to conduct such a study or another involving Laughter Yoga. Humour therapy is as effective as widely used antipsychotic drugs in managing agitation in patients with dementia – and avoids serious drug side effects, a new study shows. The first major study of the impact of humour therapy on mood, agitation, behavioural disturbances and social engagement in dementia patients found both short term and persisting decrease in agitation, according to lead researcher, Dr Lee-Fay Low, a Research Fellow in the School of Psychiatry at the University of NSW. The findings will be presented this week at the National Dementia Research Forum in Sydney. The SMILE study across 36 Australian residential aged care facilities involved the recruitment and training of a staff member to act as a “LaughterBoss” who worked with a humour practitioner with comedic and improvisation skills – not unlike “Clown Doctors” used in hospitals to aid recovery and lift mood in children. Jean-Paul Bell, the key humour therapist in the SMILE study, has set up the Arts Health Institute (AHI) to train humour practitioners and aged care staff. The AHI’s core program, Play Up, provides a playful relationship with residents and staff in aged care, focusing particularly with people with dementia. The AHI is now focused on translating the knowledge of the SMILE study into residential aged care and continues to work the DCRC to roll out this program nationally. Dementia rates are expected to double to in the next 20 years in Australia to about 450,000, mainly due to an ageing population. About 6.5 per cent of people over 65 and 22 per cent of people over 85 have dementia – an umbrella term used to describe up to 60 different conditions causing similar neurodegenerative changes in the brain. Between 70 and 80 per cent of people suffering from dementia are troubled by agitation, a problem for both patients with the disease and their carers. “Agitated behaviours include physical and verbal aggression, wandering, screaming and repetitive behaviours and questions. This is challenging for staff and often indicates unmet needs and distress in the residents of aged care facilities,” says Dr Low. The SMILE study found a 20 per cent reduction in agitation using humour therapy, an improvement comparable to the common use of anti-psychotic drugs. A major 2009 study for the UK Department of Health found serious side effects of antipsychotics, including thousands of deaths and strokes, linked to the use of these drugs in dementia and recommended a reduction in medication rates and specialised training for carers in non-drug therapies. In the SMILE study agitation decreased not only during the 12 week humour therapy program, but remained lower at 26 week follow up. Happiness and positive behaviours rose over the 12 weeks of the program, however, dropped as soon as humour practitioner visits ceased. The SMILE Study results will be presented at the National Dementia Research Forum 2011 on the 22nd and 23rd September. A documentary film, The Smile Within, produced by Hot Tin Productions and based on the SMILE Study, will also be screened. This is the trailer for a 40 minute documentary The Smile Within. The Sydney Multisite Intervention of LaughterBosses™ and ElderClowns (SMILE) Study is the world’s first high quality large scale research project that examined the effects of humour therapy on older people with dementia. The primary aim of the SMILE study was to examine the effects of humour therapy on mood, social engagement and agitation. This 40 minute film documents the study, and follows comedian Jean-Paul Bell as he delivers the humour intervention to residents in aged care facilities. We also meet staff from the aged care sector, family members of the residents and the academics and researchers who initiated and ran the study, Professor Henry Brodaty, Dr Lee-Fay Low and Dr Belinda Goodenough. This heart-warming film provides a fascinating insight into how life can be improved in aged care facilities and shows we don’t stop living, till we stop breathing*. (*Jean-Paul Bell) The Arts Health Institute in Australia is now implementing this important research in residential aged care facilities. This program is called “Play Up”. Full details can be found at http://www.dementia.unsw.edu.au/. Laughter may be good medicine for elderly dementia patients — and best of all, it doesn’t have side effects. Australian humor therapist Jean-Paul Bell was originally a clown doctor working with sick children, but now he makes the elderly laugh through a program called Play-Up. Bell was also the key humor therapist in a Sydney-based study into the impact of humor therapy on mood, agitation, behavioral disturbances and social engagement in dementia patients, a study that showed those who took part seemed happier. “The whole idea behind the Play-Up program and what we’re doing at the Arts Health Institute is encouraging them to play more because we believe that they’ve got potential to keep playing right until you take your last breath,” Bell said. He set up the Arts Health Institute to train aged-care staff in fostering playful relationships with their patients, particularly those with dementia. The study, called the SMILE study, took place over three years, involving 36 nursing homes and 400 residents. Dressed in a bright blue jacket with brass buttons and shoulder tabs, Bell uses a combination of games, jokes and songs — accompanying himself on a ukulele — to get the elderly to laugh. In addition to seeming more content, the dementia patients involved in the study seemed less agitated by 20 percent, said lead researcher Lee-Fay Low at the University of New South Wale’s School of Psychiatry. “Twenty percent sounds like a small effect but it’s about the same amount, the same effect as you would get if you gave them an antipsychotic medication — medication you would use to treat schizophrenia, bi-polar disorder,” Low said. According to the University of New South Wales, dementia rates are expected to double in Australia to about 450,000, mainly due to an aging population. About 6.5 percent of people over 65 and 22 percent of people over 85 have dementia, an umbrella term used to describe up to 60 different conditions causing similar neurodegenerative changes in the brain. Best of all, the dementia patients weren’t the only ones who benefited from the study. “The staff were invigorated, they felt that their jobs were enhanced,” said therapist Joanne Rodrigues. It has been scientifically proven that laughter is both preventive and therapeutic. People practicing Laughter Yoga regularly report amazing improvement in their health as well as a more positive mental attitude and higher energy levels. The first thing participants say is that they don’t fall sick very often; the frequency of normal cold and flu reduces or even disappears. There are daily reports of partial or total cure of most stress-related illnesses like hypertension, heart disease, depression, asthma, arthritis, allergies, stiff muscles and more. While this sounds fantastic, it all makes perfect sense, as laughter is nature’s best cure for stress. Most illnesses today are stress related and chronic stress attacks the immune system and makes us vulnerable to infections, virus attack and cancer. In fact, this is a major motive for people taking to Laughter Yoga. You can feel the difference from the very first session. You get energized; your mood changes and you feel great. With regular practice you can experience a big change in mental and physical health. Laughter Yoga practitioners are happier and healthier; they can cope with stress better, and have a positive outlook on life. 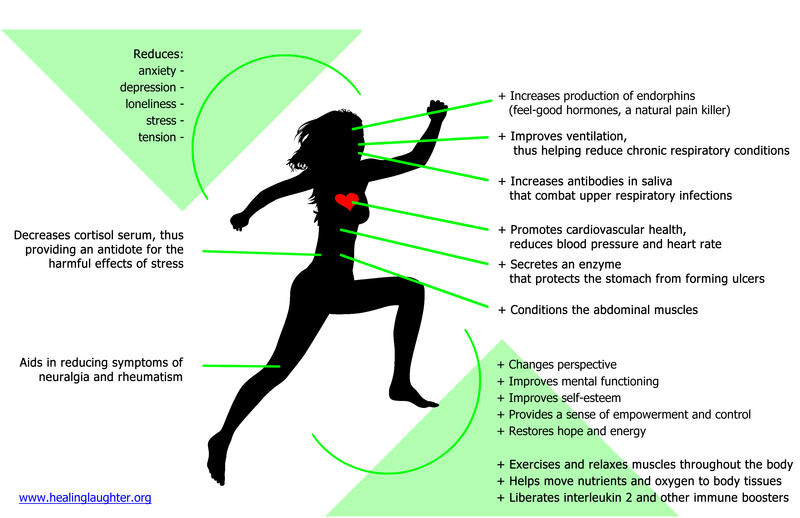 The healing effects of Laughter Yoga come from following reasons. The immune system is the master key of health and if it weakens one is exposed to constant infection and sickness. Scientific research by Dr. Lee Berk from Loma Linda University, California proved that laughter strengthens the immune system by increasing the number of natural killer cells and increase in the antibodies. Dr. Kataria says, “Ever since I started the laughter clubs, I don’t suffer from cough, cold or sore throat anymore.”The disease process has two components according to Dr. Kataria – one is the organic disease itself; and the second is the mental component in the form of anxiety, fear and depression. Why people get therapeutic benefits from Laughter Yoga so quickly is because it removes the mental factor immediately and one finds an improvement in symptoms. 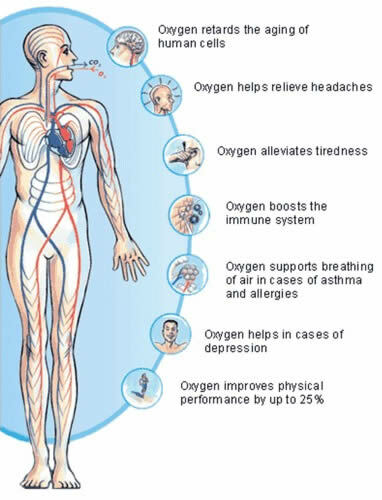 Rest of the healing effects comes from increasing oxygen supply to the body cells, strengthening the immune system, increasing blood circulation and creating positive mental state. Arthritis is often aggravated by lack of exercise and movement, particularly later in life with retirement and reduced physical mobility. Laughter Yoga provides a complete massage of all mid-body organs and is the most effective method to promote circulation in the lymphatic system. The combination of natural pain killers with movements in laughter exercises makes Laughter Yoga a powerful tool for physiotherapy. Many practitioners have reported reversal of ‘frozen shoulder’ and other movement limitations due to stroke, arthritis, and injury. Benefits of laughter have thus been recognized and prescribed. Belly laughter as practiced in Laughter Yoga is a great way of activating deep breathing facilitating better control of chronic diseases. Laughter is a safe, easy and economical method to enhance good health and longevity. Studied with Sebastien Gendry and uses Allan O’Meara’s Methods With Seniors.